The Book People was originally founded back in 1988, flash forward nearly 30 years and The Book People have become an industry respected book distributor, selling only the best books to the public and schools. During this time they have grown and expanded their catalogue. The Book People dominantly sell children's books in both the fiction and non-fiction genre. The sale / discount section of the site can be quite confusing to some, basically there are two areas where you find cheap books. Firstly you have the 'FLASH SALE' category, which tends to come and go from time to time, depending on the time of the month. Book People also have a category called 'Clearance' which stays all year round. They sell their end of line books at a fraction of the price. 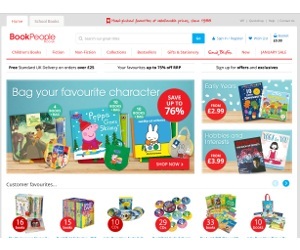 Whilst The Book People prices are generally quite competitive, they do offer voucher codes to customers and these tend to be discounts if you spend a certain amount. So spend X receive % off. The Book People currently do not offer student discount to customers with an NUS card. If this changes we will let you know straight away. Need to ask a question before you purchase? The Book People have a robust Customer Care team that will help answer your questions. You can get in touch by these three ways.